Falasca Vincenzo was born in New Grumento (Potenza), April 2, 1942. Married with two son. After completing his studies at T. Liceo Classico "Torquato Tasso "of Salerno, has a degree in classical literature at the University of Naples and was trained in the school of the great masters such as Francesco Amaldi (Latin), Salvatore Battaglia (Italian) and Nino Cortese, the great history of the Renaissance, which supported the thesis. Literary subjects taught in schools and undergraduate level. Catholic teaching has long been engaged in the institutions as mayor of his city, counsel for the Mountain Community "High Agri", Chairman of the Local Health Unit of the Val d'Agri and regional president of the ANCI-health. 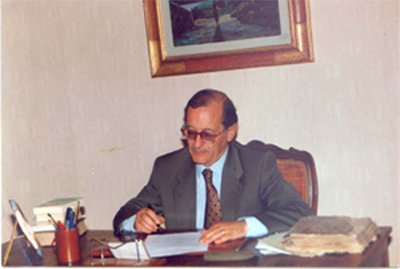 He is currently Chairman dell'IRSAB (Archaeological Institute of Historical Research Basilicata) entity that operates all over the field for the knowledge of the Basilicata historical, archaeological, social, linguistic and anthropological. He has published numerous books that have had great success with critics and a passionate and knowledgeable public. He also founded the quarterly magazine "Community territory", organ of the CM "High Agri". For his work "The Neapolitan Revolution 1799" has received 20 November 1999, the International Prize "Anna Maria Mafrice" in Milan at the "Salle luster" Press Club on Corso Venezia (new at the beginning of Corriere della Sera 19 of the same month.) The same work won first prize in the Basilicata region for the bicentennial of the French Revolution. "Special Report" by the jury Basilicata 1996 (President Thomas Pedio) for his work (which saw two editions) "Grumentum-Saponaria-Grumento Nova". For his collection of poems "Lapsus" was the winner of the 1991 "Award Selection", organized by the Maison de la Culture Ed millennium, Ragusa. His works are in major national and research on the customs of the eighteenth century Basilicata libraries have been around the world. The site can be seen in full, almost all his works, except a few who, for technical reasons, will join at a later date.